It was a Chelsea & Fulham and Meridian adventure! 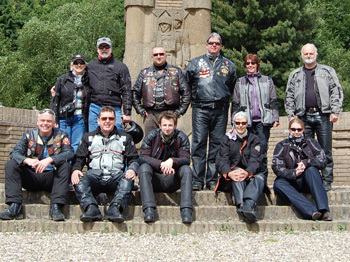 For 2009, we combined the annual C&F battlefield trip with attending a traditional HOG Rally - and with Latvia being geographically rather distant, and St Tropez being a recent memory, the Netherlands beckoned for the Benelux Rally, superbly hosted by the Rock City Chapter of Amersfoort. I’d never been to Holland on a bike but a previous family holiday there had revealed a small, neat country with good beer and food and welcoming people. The close proximity of Leersum, the rally venue, with Arnhem and Oosterbeck indicated that this year we would be paying our respects to the valiant airborne forces who failed so gallantly in Operation Market Garden in September 1944. The rally itself lasted from Friday morning until Sunday afternoon. Thursday 4th June was the 4th running of Meridian’s HOGS Legs, and I have been on every one, together with some of the recces. For next year’s 5th, I had thought of proposing a memento for those with the ‘complete set’ but my photos suggest that there’s only be three recipients which would make it a bit too exclusive, i.e. pointless! I did last man again, best seat in the house, and out of the 50 or so participants, 6 of us stayed in France overnight at a gem of a farmhouse hotel I’d found last year. We met the other Benelux rallyists on Friday morning after they came through the tunnel; Nick Deal leading, and the rendezvous point being Cite Europe. Other C&F members had made alternative arrangements, but we would meet up again over the weekend. HOGS Legs itself had another route variation this year, with breakfast in Boulogne and lunch surrounded by the bruised chic of le Touquet-Paris-Plage. Literally ‘Paris’s Beach’, at weekends the town is full of Parisian style and flair. Last Thursday it had to make do with us. Lunch was taken in the watery sun of an early June afternoon, warm it wasn’t. Andrew Papas and Dave Mollison had selected a variety of back-roads for the route, and did not forget to include the traditional unscheduled visit to an anonymous industrial estate. The theme of the day was relaxation and the unhurried pace seemed to perfectly match the mood of the participants. Well done Meridian! Having parted from the other HOGS Legs participants in Guines, a town I think we brought to a total 15 minute standstill by filling it with Harley-Davidsons, we then backtracked the few miles to our hotel at Landrethun-le-Nord. Presided over by Juliette de Boulogne, ably assisted by her husband Cédric, Chantebise is a converted farmhouse set just off the main village street in its own walled courtyard. Juliette is an excellent cook and her husband works in the local brewery, truly a combination dear to the wandering hearts of Chelsea & Fulham. On arrival we found that they were eagerly anticipating our arrival, and had marked out the courtyard for bike parking and set up a row of planks for the side-stands. Magnifique! Unfortunately a wholly inadequate amount of the local beer had been put in the cooler, but this was more than recompensed for by the excellent Merlot and blissful Calva served with dinner. Friday morning dawned bright, clear and cold. The outward route to the rally was intended to be through rural Belgium and up into Holland - it’s about 300 miles so we aimed to arrive early evening at the rally site. However this became a casualty of Calais’s uncertain weather, so to keep to some form of schedule we were constrained to use rather more motorway than intended. An early lunch was taken in Ypres (Ieper), and we easily reached the Dutch hotel by 5pm on Friday. We had booked into the Maarsbergen motel (as recommended by the rally organisers) and an unprepossessing exterior did not do justice to the warm welcome and excellent food that awaited us within. All the bike parking was under cover, and the rooms although basic were clean and well appointed. We also discovered on checking out that they clearly hadn’t bothered actually to count the number of beers and wines we had consumed, but simply added a notional ‘food and drink’ element to each bill. The 14 euro entrance fee covered everything except food and drink so we made a bee-line for the pancake house, and then meandered round for a couple of hours climbing in and out of tiny thatched Dutch houses, admiring windmills, a cheese factory and numerous dykes. Apparently if you put together some pasture land (veldt), some drainage and some pollarded willows you get a thing called a polder, which is central to the Dutch psyche. It’s also generally below sea level and prone to mosquito infestation. 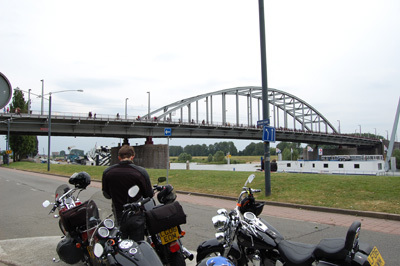 Since we still had an hour or two, it was off into Arnhem to find the ‘bridge too far’. The original was destroyed in 1945 but they have replaced it with a look-a-like, in the shadow of which we found a guide who had been a child in the town in 1944, and was later deported along with 90,000 other Dutch people when the German army ‘militarised’ the whole area. Regrettably about 30,000 of the deportees died in captivity. It is impossible to overstate the lasting gratitude held by the Dutch people for the Allied efforts to liberate them. We then returned to the hotel, dropped off the bikes and got some cabs to the rally site for the evening’s entertainment. The evening consisted of drinking, music, eating, drinking, conversation, drinking, more music, drinking, meeting old friends, drinking and... Oh, did I mention drinking? A free coach was laid on to take us back to the hotel so from about 1am it was sweet dreams all the way. 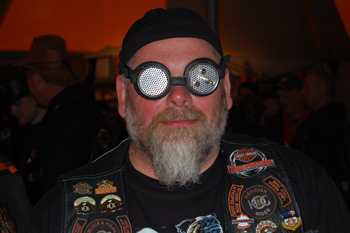 Sunday was the ‘official’ rally parade; the local town of Amersfoort is celebrating its 750th anniversary, and the local HOG chapters together with their overseas visitors endeavoured to provide 750 Harleys for the parade. I didn’t actually count them, but if you look on the rally web-site there’s plenty of video evidence of the huge number involved. Look at Harley Parade Amersfoort Deel 2 at www.beneluxhogrally2009.nl. After about 30 seconds you’ll spot some of us! Sunday afternoon we lunched in another pancake house, and then returned to a much quieter hotel. Monday morning was dry and bright so we set off to find petrol (for the Sportster) (again!) which took a while as all the local stations were Dutch credit card automatic only. Eventually we tanked up and despatched Rotterdam with some judicious motorway (no tolls but a 100 kph speed limit and numerous Gatsos). We then went by back-roads through the province of Zeeland, where the big islands on the North Sea Coat are bisected by some enormous rivers. Wide open wind-swept coast, rarely seen from the road because of the coastal defences, beaches and seemingly endless wind farms. Due to the Vlissingen ferry across the Western Scheldt now being for foot passengers only, we also experienced the 6.6 km road tunnel under that enormous river, excellent value at only 4.7 euros each. The last hop was lunch in Burgh Hamstede, then over the Oosterscheldt barrier to Middelburg and then onto the tunnel under the Western Scheldt. 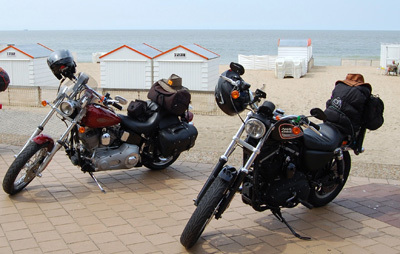 Once into Belgium, we had a last stop at Knokke-Heist for refreshments and then main-roads to Calais, where we caught the 6.20pm train back to Blighty. The last 15 miles was very wet, so we left and returned to Calais in the only rain of the weekend. 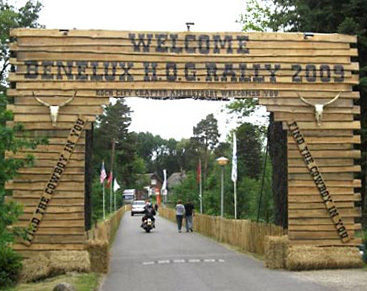 Next year the rally is in Luxembourg, another prime biking destination, so I will be strongly recommending that HOGS Legs is run on the Thursday before - so put 4th to 6th June 2010 in those diaries now - a fun time is guaranteed! The battlefield - the Battle of the Bulge, of course. Thanks to all my fellow travellers, apologies for the muddy interlude.